While I believe that the 1911 pistol, in .45 ACP, is the finest fighting pistol that we have to date, it is not the most common pistol to be used in shooting scrapes throughout history and around the world. That title would have to go to the Browning Hi Power. Since its inception, the Hi Power has been used by the armies of Belgium, England, Canada, Germany, China, Israel, and Australia….and I’m sure that I’m leaving a few countries out. John Browning died in 1926, while at the FN plant in Belgium where he had designed quite a number of his masterpieces. At the time of his death, he was working on a pistol at the request of the French military which wanted a high-capacity pistol with as few moving parts as possible. In about 1928, FN designer and engineer Dieudonne Saive took up Browning’s project and brought it to fruition. The result was a sturdy pistol, originally chambered for the 9mm (9x19mm) cartridge. It had no grip safety (something foisted upon Browning by the US Army), no barrel bushing, a magazine disconnect (another bad idea insisted upon by the military), and held 13 rounds in the magazine. By accident, or by design, it has a very comfortable grip contour that no other hi-cap pistol has ever been able to match. Over time, the Browning Hi Power has been chambered for the 9mm cartridge, the 7.62x21mm cartridge, and the .40 S&W. The pistol in this photo is a recent acquisition of mine. It is a 1985 commercial model with a baked-on black finish and ambidextrous safeties. Oh, and it also has that damnable magazine disconnect. However, in the fullness of time it will go to Robbie Barkman or Wayne Novak for a good set of combat sights, a decent finish, and a good trigger job (wherein the magazine disconnect will mysteriously disappear). I doubt that the Hi Power will replace my 1911s. I’ve simply lived with the old 1911 too long to be changing horses now. 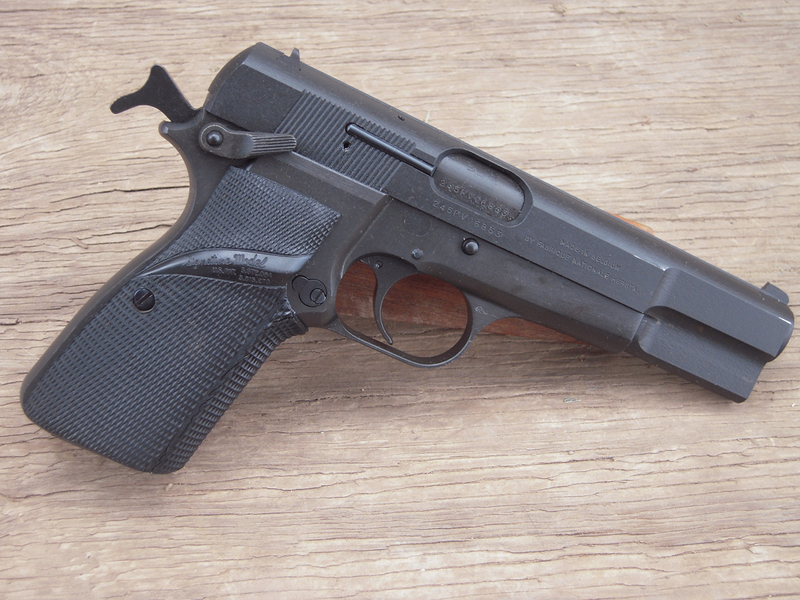 However, the Hi Power is a premier fighting pistol and a fellow just ought to have one around somewhere. In the months to come, when you read some test that I’ve done on 9mm cartridges, you can bet that they’ve been run down the tube of this fine John Browning design. This entry was posted in Guns, History, Semi-Auto and tagged 1911, 9mm, gunsmithing, Hi Power, John Browning. Bookmark the permalink. Colonel… Is /Was that Col. Jeff Cooper..? I agree about the Hi-Power. So much, that I have: a 1964 with the original box; a MK 3, with a trigger job and Pachmayr grips; a 1947 Inglis (Chinese contract); and a 1938 FN P35 (with Nazi Proofs). The MK3 is my carry choice. I have just never found a better feeling 9mm. I agree that nothing can replace a 1911. I have one that was my grandfathers and is still in great working conditions. The Hi Power is a beauty and I have wanted one for many years. Will wait for your report on the testing you do on the 9mm cartridges. I am up to 8 Hi-Powers now and almost bought another one the other day. It is a disease and it seems that I am losing the battle………….Or am I? Hi admin, do you monetize your sheriffjimwilson.com ?